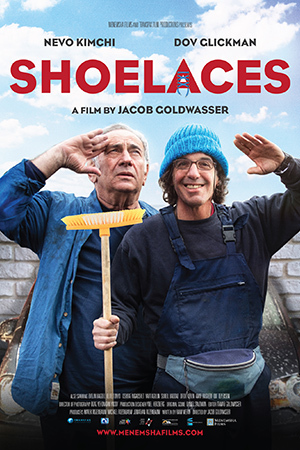 'Laces' tells the story of a complicated relationship between an aging father and his special-needs son, whom he abandoned while he was still a young boy. Reuben's (60) kidney's are failing and his son Gadi (35), wants to donate one of his own kidney's to help save his father's life. However, the transplant committee objects to the procedure claiming that Rueben, acting as Gadi's sole legal guardian, does not have the right to authorize such an invasive procedure. Gadi, who recently lost his mother, is afraid of losing his father as well. He feels he finally has the chance to do something meaningful; to become a man and stand on his own. He's furious with the committee's decision and sets out to fight for his right to save his father's life. Through the film's portrayal of a relationship full of love, rejection and co-dependency, it manages to shed some light and question the importance of human life, human connection and if life is even possible without it either one of them.